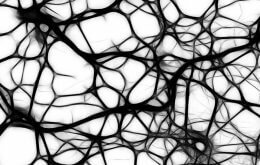 The nervous system is built to last a lifetime, but diverse diseases or environmental insults can overpower the capacity of neurons to maintain function or to repair after trauma. A team led by Dr. Hernán López-Schier, head of the Research Unit Sensory Biology and Organogenesis at Helmholtz Zentrum München, now succeeded in promoting the repair of an injured neural circuit in zebrafish. The researchers used this system in zebrafish larvae** which had interrupted sensory lateralis nerves***. “However, when blue light was shone on severed nerves that expressed a photoactivatable adenylyl cyclase, their repair was dramatically increased,” remembers PhD student Yan Xiao who is the first author of the study. “While untreated nerve terminals only made synapses again in five percent of the cases, about 30% did after photostimulation.” In simple terms: the scientists were able to stimulate the repair of a neuronal circuit by elevating cAMP with blue light. “Optogenetics have revolutionized neurobiology, since the method has already been used to modify for instance the electrical activity of neurons. 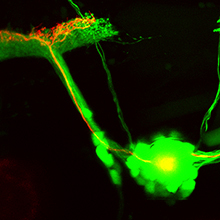 However, our results show for the first time how the repair of a complex neural circuit in a whole animal can be promoted remotely by the use of light”, explains López-Schier. But the head of the study thinks that this is only the beginning: “Our results are a first step. Now we would like to investigate, whether these results can be extrapolated beyond single neurons in zebrafish, to more complex neuronal circuits of higher animals.” The scientist could think of using this method for future therapeutic approaches for the treatment of neuropathies like those occurring in the wake of Diabetes and other diseases. * Optogenetics: As the name indicates, this cutting-edge technology combines elements of Optics and Genetics. Scientists make use of proteins which are sensitive to certain wavelengths of light. These are brought into the target cells with certain genetic methods. The so treated cells then change their respective phenotype depending on the exposure to light. ** Larvae of zebrafish are particularly well suited for optogenetic approaches, since their skin in transparent/translucent. Thus, the light can reach the respective target cells easily. *** These nerves normally communicate external sensory signals to the brain, but cannot normally repair after injury. The independent Sensory Biology and Organogenesis (SBO) research unit works with a zebra fish model system to examine cellular, molecular and physiological reactions to mechanical stimuli and sensory disorders. The focus areas are physical and mechanical tissue properties. The objectives are to examine the mechanisms that control sensory system development, self-regulation and regeneration and to research the evolution of the sensory organs that perceive the environment.